Leeds United inched their way closer to safety in the Sky Bet Championship, but were disappointed to be held to a goalless draw against in-form Nottingham Forest. In front of the biggest crowd of the season at Elland Road, the game never fully came to life with Forest seemingly content to take a point back home with them and a draw doing the Whites no harm as they get closer to their 50-point or so safety target. United fielded the same side that battled to a win at Wigan last week with Steve Morison surprisingly stuck out on the right wing and Billy Sharp up front on his own. The tactic did not really work, but Leeds started positively with Morison getting in an early header that was easily dealt with by Forest keeper Karl Darlow and Charlie Taylor free in the box only to slightly hesitate and see his shot well blocked by Darlow. It was to prove probably the Whites’ best chance, although Scott Wootton headed an Alex Mowatt free-kick over. Forest’s first threat came on 21 minutes when Ben Osborn’s shot from the edge of the box was well held by home keeper Marco Silvestri. Michail Antonio looked a threat down their left, however, and he got round Wootton, but his low cross led to Osborn’s shot being blocked. From the resulting corner Sol Bamba flicked the ball on and Jamaal Lascelles shot over from point blank range after not expecting the ball to fall to him. Amazingly referee Keith Hill gave Forest another corner, but fortunately it came to nothing. At the other end, Luke Murphy, who had a good first half, made a strong burst forward only to see his shot from the edge of the box blocked. The ball fell invitingly to Morison, but he kicked the ball with the inside of his foot instead of the outside part he was aiming to use and the ball went out for a throw-in, to much amusement in the crowd. Antonio shot wide from the edge of the box for Forest after another threatening run while Taylor’s curling shot from 25 yards out was easily dealt with by Darlow. Lewis Cook’s flick from a low corner was well blocked by the Forest defence, who then survived a big shout for a penalty just before half-time when Cook went down under a challenge from Eric Lichaj only to see his claims waved away by the referee. Forest started the second half better with Antonio threatening once more only to see his weak shot easily saved by Silvestri. Taylor shot over from distance for Leeds, but they were grateful to their keeper again on 63 minutes when he was out quickly to save at the feet of Antonio after the Forest man had gone past back pedalling Giuseppe Bellusci. Sharp was denied by a good block as United finally put a decent move together in the second half, but the ball was quickly down the other end where Silvestri saved well low down to save from Chris Burke. Leeds boss Neil Redfearn threw on strikers Mirco Antenucci and Souleymane Doukara to try to break the deadlock and United came closest to grabbing a late winner. Mowatt’s shot was blocked and the ball fell to Antenucci, whose follow-up was well saved by Darlow. A minute later Murphy fired over from distance, but that was it for the Whites as their challenge faded in the final minutes. Forest were presented with one last-gasp chance in the fourth minute of added time as the referee gave them a controversial free-kick on the edge of the box, but it summed up the game when Henri Lansbury curled his shot harmlessly over the bar. 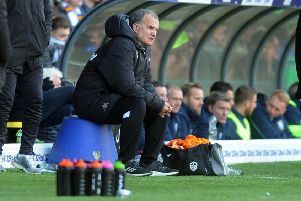 Leeds head coach Neil Redfearn was happy enough with his team’s performance and praised the players’ efforts, particularly in defence. “I thought we played well enough and we defended well enough. We looked solid at the back. “It was a good clean sheet. Forest are on a good run. We haven’t got beaten, which is important. “Antonio is a big threat, but I thought Scott Wootton stuck to it against him and was outstanding. Berardi did well against Chris Burke on the other side. We dealt well with two good wide players. Leeds: Silvestri, Wootton, Bamba, Bellusci, Berardi, Morison (Antenucci 67), Murphy, Cook, Mowatt, C Taylor (Doukara 79), Sharp. Nottingham Forest: Darlow, Mancienne, Lascelles, Wilson, Lichaj, Burke, Gardner, Osborn, Lansbury, Antonio, Blackstock.